As far as laptop concepts go, it’s hard to find something truly new. The form remains basically the same, no matter how it functions. But designer Tommaso Gecchelin has come up with a surprising new configuration that combines the best of a notebook, netbook and tablet. His MacBook Touch design can go from the basic screen-and-keyboard layout to a full-size tablet to a two-sided tabletop display with ease. It’s not a dual-screen setup; rather, it’s one flexible touch screen integrated with the as-yet not invented technology called iSpine that will allow it unprecedented flexibility. The designer compares it to the flexibility of the human spine, though we’ve never seen a human spine bend like this. Although it wasn’t commissioned by Apple and may never end up seeing production, the design is truly a thing of beauty. 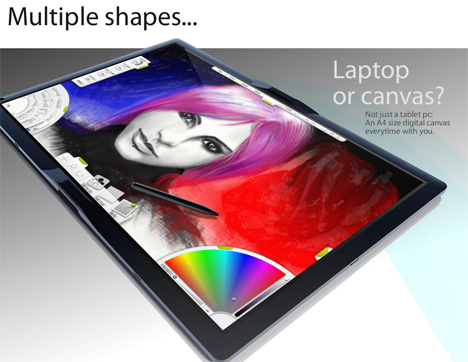 Imagine having all of these configurations at your fingertips without having to buy multiple devices. When fully extended, the display is the size of a sheet of A4 paper but doesn’t have any “dead” space in the middle; you can even bend it all the way “backwards,” making it an ideal ebook reader. OLED technology is making this type of of device more and more possible. 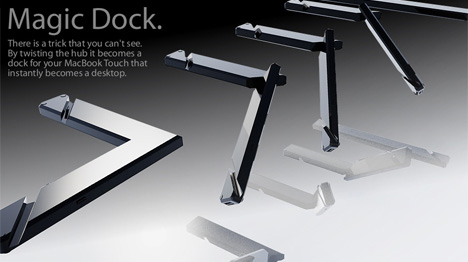 The Magic Dock, a thin external device that houses the power and USB ports, twists to create a stand on which the computer sits when it’s fully extended. 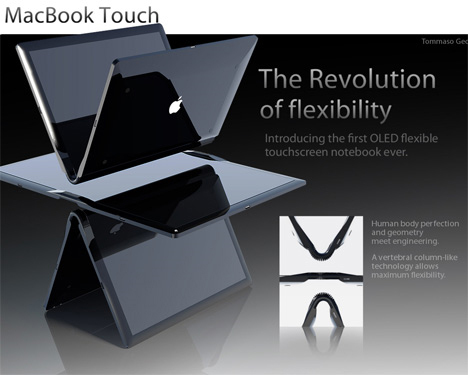 The MacBook Touch would also come with an iPen, an input device that would work much like the stylus of any tablet PC. When in a notebook configuration, the “keyboard” would be an on-screen touch keyboard, much like the one currently in use on the iPhone and iPod Touch. 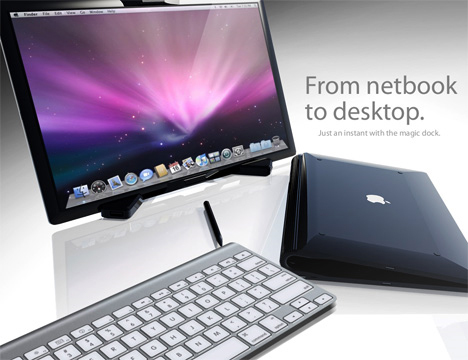 A wireless full-size keyboard would be available as an accessory, also. Of course, Apple doesn’t typically pick up ideas from third-party designers, but much of what Gecchelin proposes seems to be in line with the way notebook technology is moving. We are increasingly demanding machines that are more portable, more adaptable, and more multi-functional. 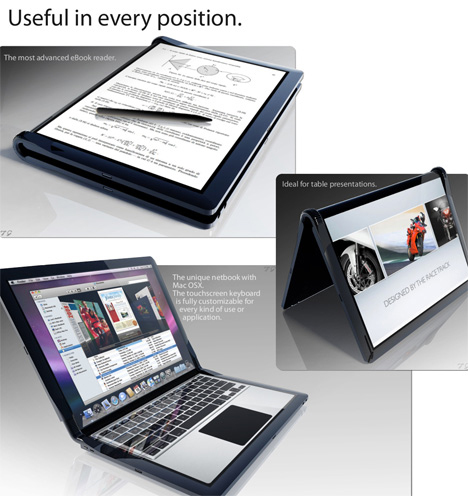 The bendy, completely customizable display of Gecchelin’s design would allow the sort of freedom that it’s hard to find on any existing laptop, tablet or desktop computer. Even if Apple doesn’t produce it, it seems pretty feasible that we’ll be seeing this type of notebook sometime in the near future. See more in Computers or under Gadgets. November, 2009.